We offer karate programs for Youth and Adults alike. All skill levels and all ages. We believe in a learning environment that is fun, educational and respectful. Your child will learn discipline for others as we train and how to unlock their own individual potential. Karate is an individual sport, yet we learn respect and discipline by learning from each other, not competing with each other. We are reiterating this every time we bow to each other and say, “onegai shimasu” (please teach me). Respect for each other, respect for the teacher and respect for yourself are aspects of karate training we instill in our students. Discipline and respect carry over to other areas of your child’s life including the classroom and at home. We don’t just teach how to punch, block, kick and grapple, but how to gain self-confidence in oneself. Karate training isn’t just about learning self-defense and being part of a healthy lifestyle, it’s about discovering one’s abilities and overcoming inhibitions. We train to become stronger – physically, mentally and emotionally. Elementary to Junior High school aged children learn self-defense, physical fitness and respect/etiquette and attitude through IOGKF Goju-Ryu Karate. 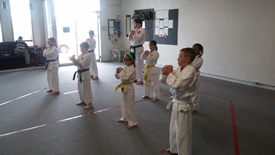 Elementary and Junior High School aged children learn karate in a safe, controlled and fun environment. Learn respect for each other, for themselves and learn how to avoid confrontation. Ages 14 and up learn IOGKF Goju-Ryu kata. You can expect to lose weight, gain greater energy, and develop a stronger, better-toned, healthier body. Develop physically, mentally and spiritually by learning traditional Goju-Ryu Karate. Build confidence and learn self-defense. Women learn how to be aware, be confident and how to defend themselves. Because self-defense is more than punching and kicking, we teach how to help avoid situations as well as various striking techniques. Classes are held as a special program. Dates to be announced.